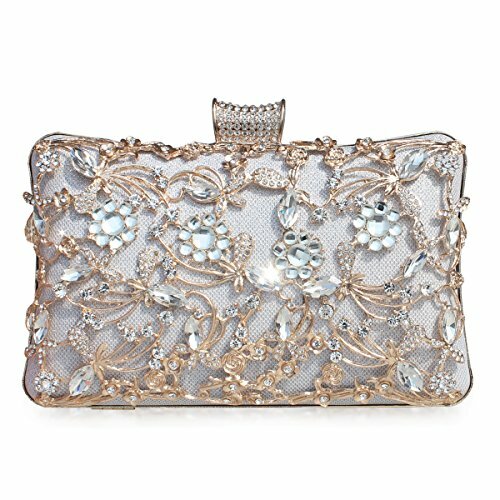 GESU crystal evening clutch,A women's fashion handbag collection,Which is stunning bag make you elegant and gorgeours in dressy occssion. GESU is specialized in clutch purses for women evening,More Professional,More Focus,We believes every woman deserve to be better in every occasion and even much better like wedding,banquet,party or any Special Social Activities,captures all the surrounding eyes,Make you more confident,we really love to see the best of you,Because More Satisfying to our customer is the important persuit of GESU,afforable price, Definitely worth to buy. Closure:Metal frame construction with clasp on the top. Size:8.5"L x 1.6"W x 4.3"H inch,detachable strap is 45.8"inch. Use Style: Evening Handbag/Shoulder Bag/Party Purse. Your highly quality of shopping experience is what we are purchasing for.As an honest Amazon seller,we offer convenient and efficient.after-sales service;If you receive goods which is not in good condition or any defects,Pls feel free to contact us if there is any problem.We will follow up within 24 hours and try our best to solve your problem,which is highly appreciated and welcome and we also welcome you to share your comments.